I figure that headline is enough to get you to read this item. Wheat whiskey we know. White whiskey is a growing market. But malted wheat white whiskey? 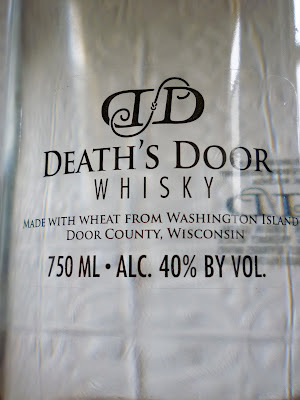 This product, surely unique (for now) in the liquor market, comes from Death's Door, the Wisconsin micro-distillery that already produces a vodka and a gin, and, for my money, it's the best thing they've done. I encountered it at Bar Celona, the new Spanish-influence cocktail and tapas bar in Williamsburg, Brooklyn, where Tad Carducci of Tippling Brothers is in charge of the cocktail program. I had had a couple drinks, and was about to clear out when a colleague recommended I try the Albino Old-Fashioned. Well, "Old Fashioned" are two words (one word?) that always catch my ear. So I stayed and had another. Am I glad I did. It was one of the most original and delicious spins on the old drink I had ever had. It was composed of white whiskey, sugar, bitters, brandied cherries and grapefruit peel, and was as mellow and smooth as a southern California day. I asked what whiskey was being used and the bartender showed me what appear to a clear bottle, the kind waiters plunk down in trendy bistros as your water decanter. Looking more closely, there were a few words on it, near the bottom, in black. 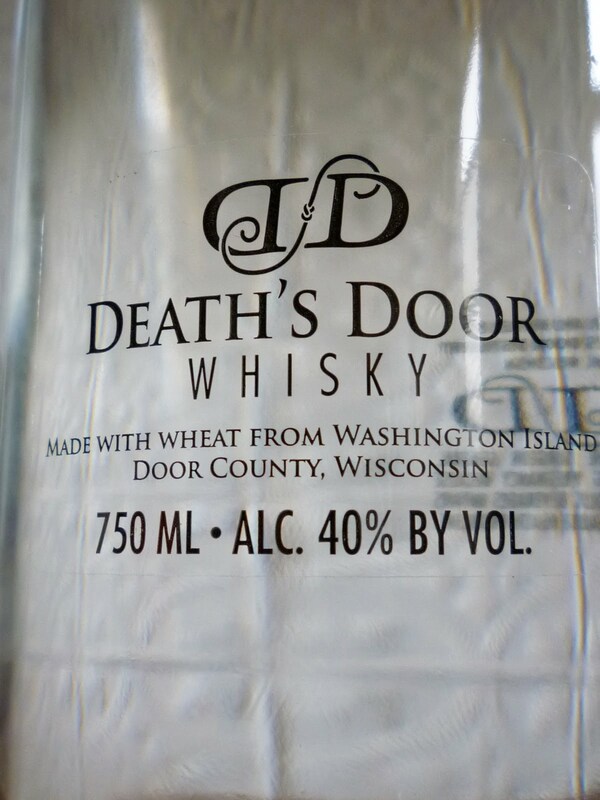 "Death's Door Whiskey." Then, in smaller letters "Made with wheat from Washington Island, Door Country, Wisconsin." To me, the simple bottle is one of the great design triumphs in modern liquor packaging. My colleague and I thought that this might be the first appearance of the product in a New York bar, but we weren't sure. Death's Door rolled out the whiskey last year. It's not just another moonshine jumping on the bandwagon. It's an unusual un-aged combination of 20% malted barley and 80% organic hard red winter, all grown grown in Washington Island, which lies in Lake Michigan just off the Door County peninsula in Wisconsin. It sits in stainless steel barrels for three weeks and then oak barrels for 3 days, at which point it’s bottled. The result has a beguilingly fruity nose of melon, a few vague tropical traces and baked sweet breads. (Not sweetbreads, but sweet breads.) It's strongly flavored, but mellow, as I saw, and soft, with muskmelon, golden raisins, baking spices, apple, maybe some white pepper. It's not hugely deep, but it's hugely appealing. And it has a long finish, a nice companion on a cold night. I made a Old Fashioned for myself at home using the stuff. It wasn't as good as the one at Bar Celona (I didn't follow their exact specifications), but it was damn good. While were on the subject of Death's Door, the company has wisely listened to their marketing people and debuted some new bottles. It miles beyond the old, dull, high-shoulder wine bottle with a simple map of Washington Island on the label. 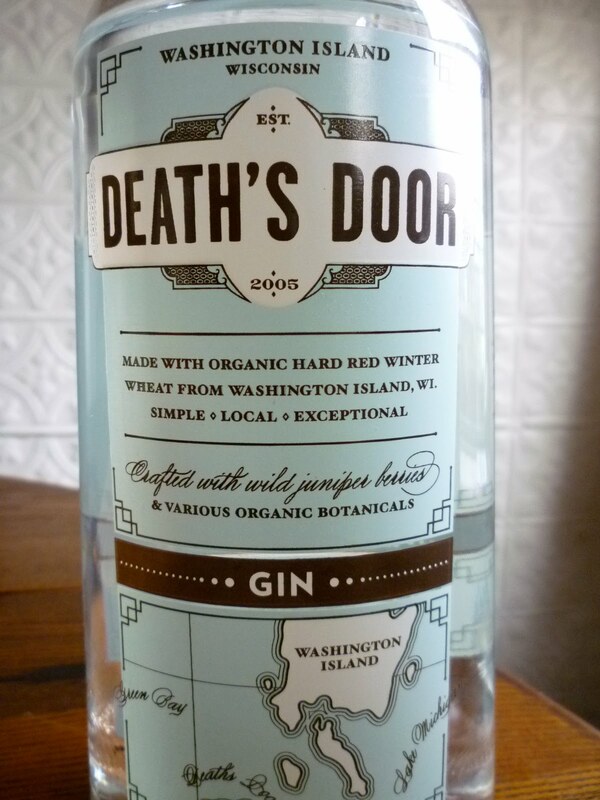 Death Door's Brian Ellison tells me I'm the first to see the new bottle, even before the new distributors. Which means you, readers, are the first enthusiasts to eyeball it on the Internet. 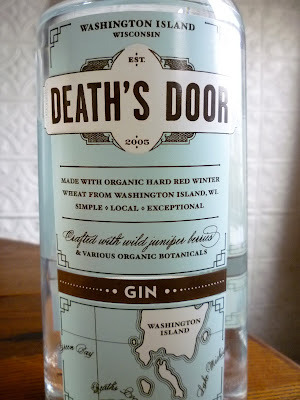 Death's Door White is a favorite of mine as well as my father's new drink of choice. I'm fortunate to live in the Madison area, and Brian keeps my local liquor store restocked every few months. I've always drank it neat or on the rocks, but the Albino Old Fashioned does sound exceptional.